Edinburgh – The Northern Stage: Once in a House on Fire – LIVE! Thanks to a collaboration between the BBC and Arts Council England, on a rainy Sunday afternoon, from the comfort of my own home I was able to enjoy watching plays streamed live from the Northern Stage at St. Stephens in Edinburgh through a portal called The Space. An ambitious project to bring together the best and the brightest of Northern plays in a converted church, done specially for the Edinburgh Fringe by a Newcastle-based theatre company called Northern Stage. Interspersed in between the live plays were a number of short films, also commissioned as part of the venture that beautifully transcribed the problems and challenges that the team had overcome. Previously, the Nexus Book Group has discussed Andrea Ashworth’s harrowing memoir Once in a House on Fire. The book had a mixed reception, with the content too harrowing, or too vague for some. I commented that it would probably have worked better as a play as there were distinct snapshots of the narrator’s past throughout the novel. Little did I realise that Monkeywood Theatre had already embarked on a research and development performance a year earlier. A memoir from Andrea Ashworth, it tells the story of her and her two sisters growing up in the suburbs of Manchester and the tales of their various abusive step-fathers. Can any of them escape the vicious trapping cycle they find themselves in? 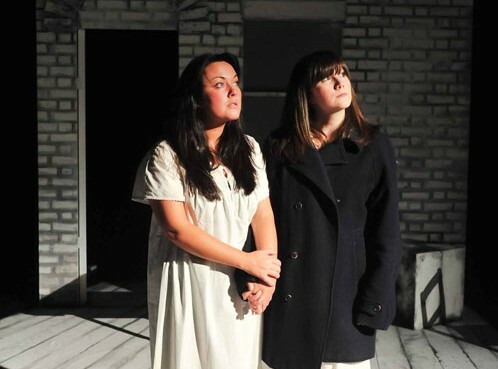 Monkeywood have taken it to the Edinburgh as part of the Northern Stage programme. Trimmed down to a three hander, a impressive trio of actress perform a harrowing, and at times, bleak story. The undoutable star of the show is Sarah Macdonald Hughes, who not only has adapted the novel into the play, but also stars as Andrea. Rachel Austin principally plays Andrea’s sister Laurie whilst Francesca Waite mainly plays Andrea’s mother, but both also take on other roles during the play. The fashions and music are just as vibrant and scene setting as they were in the novel. Here, greater use is made of appropriate music to reflect the particular scene – Joy Division’s “Love Will Tear Us Apart Again” and The Human League’s “Don’t You Want Me” two particularly well timed pieces. The actual scenes of abuse take place off-stage. The first indication that all is not well with the family comes when Andrea wins a copy of The Secret Garden and wants to take it with her to Canada. Her ‘father’s reaction is to beat her, and rip the book to shreds. The starkness and simplicity of how this is handled on stage is brutally effective as the actresses to convey the fear and destruction that abusive relationships cause in a sensitive and shocking way. Francesca Waite’s mother, played very well by her, but as we had discussed in our book club appears to be a particularly weak character. Going along with the abusive nature of her spouses, she finds excuses for them. She fails to believe, or stand up for her daughters, continually ignoring them for what she considers to be the greater good – especially when they have achieved something. She rails against the futility of trying to keep those she loves around her towards the end and comments that “I’ve lost the knack of me own person without a man telling me what to do”. Whilst the depression Andrea’s mother entered into is glossed over in this adaptation, she still remains a fairly unsympathetic character. Unfortunately, where I thought that Once in a House on Fire’s biggest success would be in capturing these fleeting moments, it is also its downfall. Whilst it is a very competent production with a compelling narrative, the production feels disjointed, probably more a reflection of the original material rather than the stage production. Names fly around making it easy for the audience to get lost, especially given the small cast. If the intention is to highlight the strengths of Andrea’s character in comparison to those around her, it isn’t a complete success. Only in the dying moments does she outwardly display her inner strength making for a disappointingly flat conclusion. But then, so did the book. Once in a House on Fire is on at the Northern Stage, St. Stephens until Saturday August 25 daily at 14.40 (except Monday 20). You can find out more about Monkeywood on their website. ← Edinburgh – The Northern Stage: What I Heard About the World – LIVE!